I can only imagine what ran through James Stewart’s mind two weeks ago in Florida, when he realized he had pulled a bunch of off-duty officers. “Ooops” or more probably “Oh s%!t” were probably the first thoughts, and after that, it seems like instinct may have taken over, so he just took off. 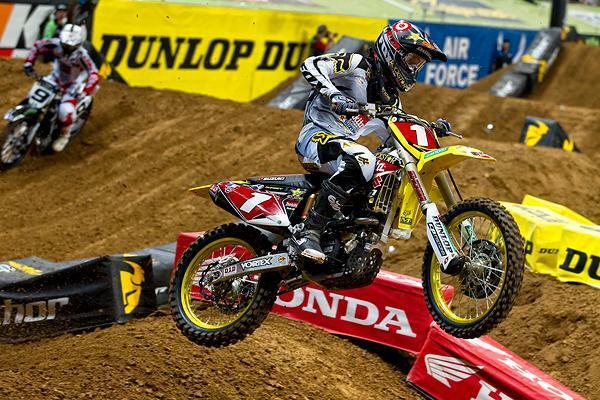 James Stewart let instinct take over, and he took off. And look at this: he’s only 16 points back with three races to go. After all of these crashes, all of this drama, all of these moments of finally looking mortal and beatable, he’s still in striking distance. I really don’t understand the math here. Haven’t the last two months been horrible for James? Didn’t I say last week that parity was here and here to stay? How the heck is he right back in this after just one clean race? Stewart has come a long way in a couple of weeks. Maybe the parity is still there. Remember, the last time James won (A2), we speculated right here in this column if it was a signal of dominance to come, or just one good night. It was, undoubtedly, just one good night, because (as absolutely no one would have predicted) it took over two months for James to win another. So there’s a chance this win signals nothing, and we’ll go back to the craziness this weekend in Seattle. I heard it may rain there…. That’s what has always made James Stewart dangerous: when he’s on and he doesn’t take himself out, no one can stop him. After yet another sub-par ride last weekend in Dallas, I thought maybe that era was over. Now it could be back on. If he managed to win out, he could gobble up 16 points and leap over three riders in the standings. Totally possible. That said, he has absolutely no room for error. It’s like he was down 3-0 in a seven-game series. He must win. If he gets even a third this weekend, it could be the final nail in the championship coffin. I stole a free upgrade in my rental car over the weekend and got one with satellite radio. Had ESPN radio on, and I got to follow the never-ending drama of Tiger Woods at the Masters. On Friday evening, he finished up strong, and the “Tiger is back” buzz began to brew. People seemed excited. Then he played poorly on Saturday, so by Sunday morning, ESPN experts were back to calling him selfish, arrogant, and disrespectful to the game. Then Tiger put in another beautiful charge on Sunday, and the world loved him again. It was just fascinating to see moods change so quickly—the villain one day, the hero the next. 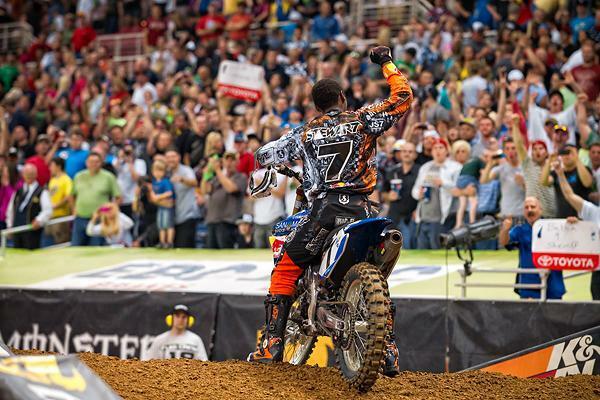 To see what that looks like, check the comments section of this article by about Wednesday afternoon—you’ll see plenty of praise and venom for James Stewart. Stewart got a much needed win in St. Louis, keeping his championship hopes alive. 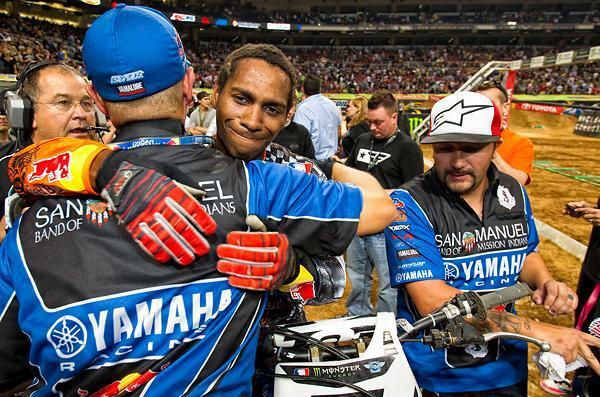 The parallels between Woods and Stewart have been stated so many times that when we hear “The Tiger Woods of motocross” I’m not longer even sure which reason we’re talking about anymore. But comparison number 937 showed up when Woods tried to rebuild himself in front of the world in Augusta. It was eerie the similarities. Amazing how you could have so much doubt on these guys for so long, and in just a short time, see just how spectacular they were and buy in all over again. I wanted Tiger to win just to see him cry like James and ring up comparison number 938, but he had dug too big of a hole earlier to get the title. He may have Tiger blood, but he wasn’t winning. Maybe Stewart has dug too big of a hole to get out of this year as well. And we may never completely, totally have the definitive answer of what the fans really think of these two. It changes from moment to moment—hero one moment, villain the next--which is the reality of being that big of a star (for Tiger, a big star in the world, for Stewart, a big star in our little world). The only consistency is that, win or lose, winning or losing for them always seems to be the story. Make that comparison number 939. Or have we made that one before? Dungey is second in points and gaining on Villopoto. Dungey is really riding well right now and kept Stewart honest through most of the main. Back at Anaheim 2, I had no doubts from the fourth turn that Stewart was going to win, even though he only won by 4.1 seconds. This time the gap was about the same, about three to four seconds, but there were moments where I thought Dungey was going to get closer. And, of course, just as Stewart has the puncher’s chance of winning the race, there’s also the chance that he will just go down all of a sudden, so you have that to look for that, too. Didn’t happen this time. I don’t even understand how Stewart can be down just 16 points. He’s thrown this season away what, two, three times? Reminds me of the 1992 season, when Damon Bradshaw won five of the first six races (with an extremely high level of awesomeness), took second at Daytona, sixth after a bad start in Charlotte, and then suddenly was only up 16 points. The dude made everyone else look bad for five weeks, and the competition was still within striking distance? In regards to this season, I guess it’s easier to stay in the hunt when the points leader fails to qualify for a main event as some point, and the guy who is second in points DNFs with a derailed chain. And that’s where the “Ooops” part comes from. They may have left given James just enough room to squeeze back into this. I think Dungey could have done more to stop it this weekend. Clearly, Dungey is going to play the consistency hand this year, and that may very well work out. But maybe not! Last week in Dallas, there was a moment where Stewart got out of shape in a rhythm lane—not Indy launching the jump sideways out of shape, not Matthes out of shape—but still pretty out of shape. Dungey just happened to be positioned inside for the next left hander, that 90-degree corner before that ridiculous section of whoops. He had a chance to run it in on Stewart, take advantage of a mistake and try to make something happen. Instead, he got on the brakes. He backed out of it. He wanted no part of the contact. 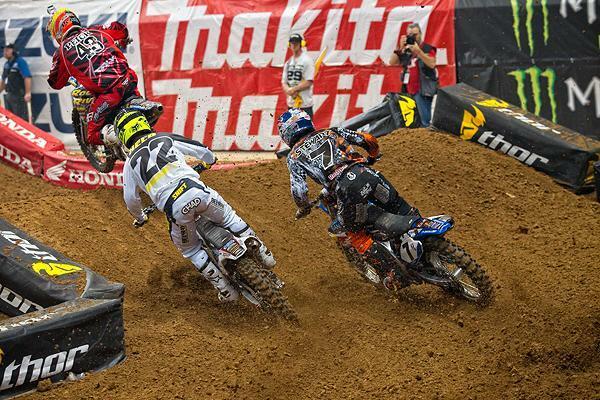 On the first lap in Dallas, Stewart got inside of Dungey. Dungey squared back a bit in the next corner, tried squaring him again and squaring him again, but I don’t feel like it was the full 100 percent attempt to make it happen (to see how the square up works when applied at 101 percent, check out Tedesco in the heat race—Stewart got him and Ivan got him back). Reed had another tough weekend but is still in the championship race. I think Dungey could have been more aggressive. But that’s the hand he’s playing. He’s not taking huge chances to gain one position. Other riders have, and they’ve hit the ground, each other, or both. 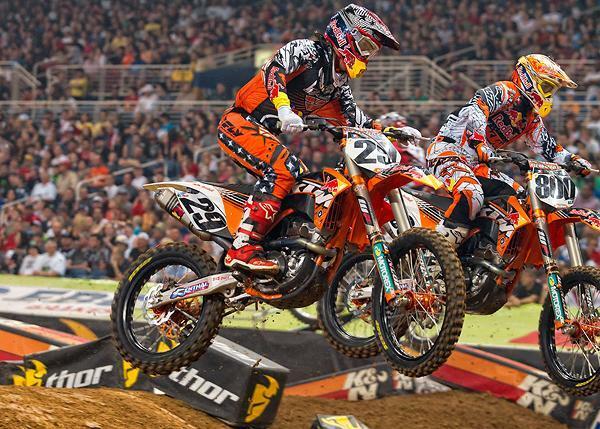 Will Dungey’s strategy work in the long run? Impossible to tell until after the checkers are out in Las Vegas. I’ve said it before: if Dungey gets this championship, he’s going to look like a genius. If he doesn’t, it’s going to look like he left something out there. But in this season, everyone will be able to second-guess something. Some were too aggressive at times, some not enough. Only after Vegas will we know who played their cards best. Ryan Villopoto was third. He was battling Stewart off the start and wheelied way high, putting him pretty far back. He made some great moves early to get toward the front, and he quickly adopted the triple-triple jump that Stewart and then Dungey were using. But he couldn’t catch them. I think RV2 had a slight edge on the field when the season began. I think everyone has improved just enough to match him now. In January, I think he would have caught Dungey in a race like this. In April, it didn’t happen, because everyone has raised his game. 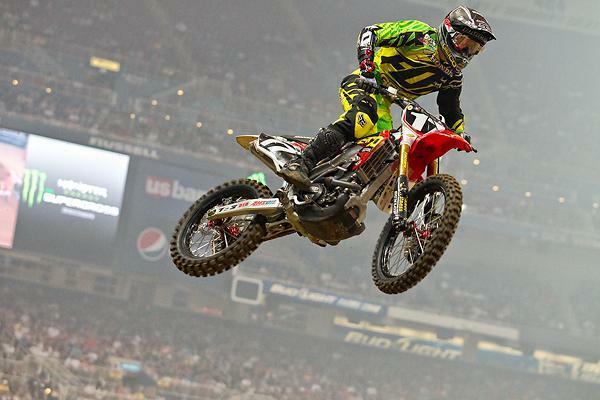 Chad Reed wasn’t on it this night. He’s like a veteran pitcher who doesn’t always have the unhittable stuff every night like he used to, but has enough guile, cunning and guts to stay in the hunt on the bad nights. And sometimes, he still has the old zip on the fastball. He didn’t jump the triple-triple, and that seems strange for a guy like Reed, who is known as one of the greatest supercross riders ever. He usually handles the big leaps, right? Usually, yes, but not all the time. This is not the first time I’ve seen Reed steer clear of a big risk. In most of those years, he was riding a carbureted Yamaha and I’ve heard people put blame on the bog. Maybe that was the case back then, but I also think there’s a reason why Reedy is known for consistency. He’ll do the big leaps most of the time, sometimes he’ll even bust it out for the first time in mid race. But he’s never been crazy balls. 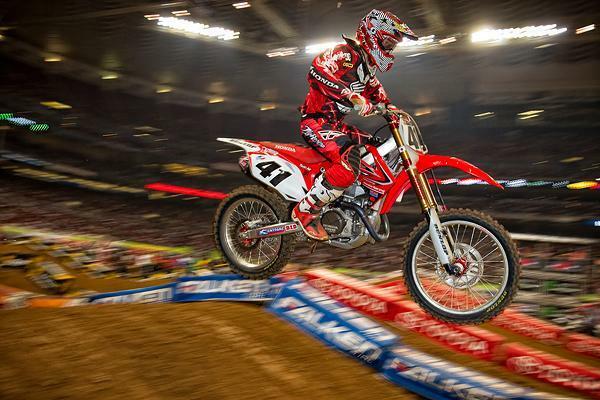 Rookie Trey Canard needs help if he is going to win the championship. Trey Canard was fastest in practice and was really carrying the momentum, but he got a bad start and that was it. Last week I said momentum is only as good as the next week’s start. I’m loving these baseball/pitching analogies right now. In the Lites class, Justin Barcia took a major step with his win. After the race, I asked his Team Manager Mike LaRocco about Barcia’s wrist injury and the All Sport Dynamics wrist brace. Mike says he actually went and found his wrist brace from 1992, and it’s basically the same thing Justin is running right now, just with some updates (and cooler graphics). He says the brace prevents the wrist from bending way too far back if you overjump something, and that’s perfect because Barcia told me that’s about the only time the wrist bothers him (not a problem in the whoops, believe it or not). So for supercross, everything is fine, but LaRocket/The Rock/Iron Mike/Manimal told me he is concerned that Barcia’s lack of riding and training during the week may end up being a problem outdoors. Justin Barcia has just about wrapped up his first career Lites SX championship. Sipes and Baggett had up and down races. I thought for sure Sipes was going to get Barcia at one point, and I thought for sure Baggett was going to get Sipes later. In the end, no one passed anyone. Wilson finished fourth, and I swear about 15 seconds after the race he tweeted “Didn’t have it tonight.” These kids are good with the Twitter. Kevin Windham is getting faster after his mid-season swoon of bumps and bruises. He was fifth in Dallas and sixth in the STL, the easy winner of the “fastest of the non big five” sweepstakes. But Windham just wants it to be a big six. He also had a big crash in practice, but the ever-talkative LaRocco informed me that the injuries were limited to “mainly his frank and beans.” Okay! At one point Justin Brayton looked like “fastest of the non big five” but after a big crash in Dallas, back problems kept him out in St. Louis. He tried to ride a few laps in practice, and he still rode out for opening ceremonies in street clothes. RealTree had a lot of fans in the building since this is the home race for the Iowa native, but he couldn’t race. I should have offered him a back rub. Too far? 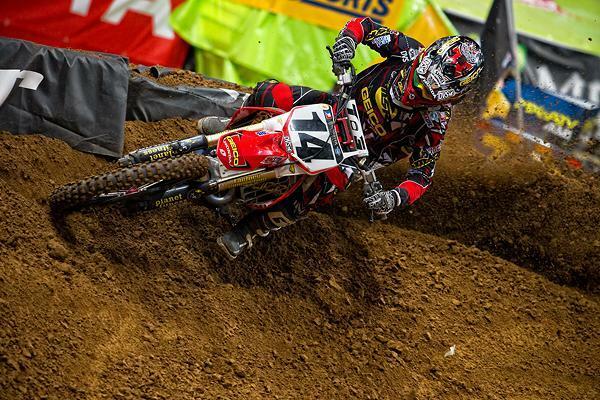 Both Short and Alessi had tough nights in St. Louis. Andrew Short has also made a bid for “fastest of the non big five” at times, but he wasn’t very spectacular on this night. We did a podcast today and Jason Thomas thinks maybe the tacky soil highlighted the power advantage of a 450. Listen to the show and give him the credit. There are some dudes out there who are definitely trying. Lites rider Lance Vincent got some good starts on the night and pushed it to the absolute 10/10ths of his abilities to run the pace. He was casing jumps and not caring because he clearly wants to prove himself—it was good heart from a rookie who could hide behind the “just trying to get the feet wet” excuse. Also, poor A-Mart (Alex Martin, people, obviously!) was doing all he could to hold off Matt Lemoine for the final LCQ spot and he crashed on the last lap. He was trying. And Lemoine also had a rough night, crashing spectacularly over the bars in his heat, but soldering on. I feel like every week I read a tweet about Lemoine making a long drive while dealing with soreness. That is true privateer life. Also, Malcolm Stewart took a big header in practice (they later changed the track where he crashed—to the behest of, ironically, big brother James!) and tried to go in the heat race. The pain was just too much, but don’t ever doubt the toughness of these kids. Windham had a solid ride in St. Louis. Matthes didn’t show up to St. Louis, so I inherited a job from him: goggle guy. I was very excited to provide Tommy Hahn and Mike Alessi with some fresh kit from Eks Brand. It may have looked like I merely handed off a ziplock bag with goggles pre made by Matthes, but oh no, I went to the wall for these goggles. Matthes shipped them to my hotel, but the room wasn’t in my name, so the hotel refused delivery and sent it back to the UPS warehouse. I broke my “wrong turn u-turn” record trying to find the place, but luckily, I had saved the day and four eye balls. Hahn finished 11th Alessi took 17th, and I ate not one but two meals inside the rival Scott Motosports truck. Winning! We’ve reached the end of the road, but there’s so much more to go. These final three races are going to be the cause of more speculation, second-guessing, bench-racing and gossip than perhaps any final three rounds ever. It’s pretty much like supercross has adopted a playoff format, and right now Villopoto gets the first seed and a home game this weekend. Can’t wait to see how it goes.